The Baby Trend Royal SE Travel System in Confetti Blue is the perfect choice for life’s new adventures with your little one. Attractively styled in the gender-neutral Confetti Blue fashion, this Travel System is designed with printed rear tubing in a modern day geo pattern. When your own child is an infant, use the stroller as an baby car seat provider by simply removing the seat frame and snapping in the incorporated baby car seat. Once in stroller mode, fully personalize your journey with the reversible seat frame. The three-wheel stroller is easy to move around with 10 inch front and eleven inch rear EVA tires and practical rear brakes. The stroller seat is nicely padded and will provide maximum comfort because of to the several position recline and the adjustable 5-point safety utilize with padded harness covers. 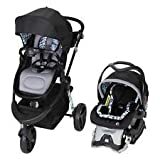 Additional stroller features include an adjustable 2-panel canopy with a peek-a-boo window to protect your baby from the sun and wind, as nicely as an easy trigger fold for quick and compact storage. The swing aside bumper bar can be easily removed and arrives equipped with a 3-position clip-on drink/snack tray for your baby’s convenience. Also packed with thoughtful storage solutions, the Royal SE Baby Travel System includes a removable soft parent organizer with 2-cup holders and a zippered storage pocket. Also included is the top rated Infant Trend EZ Flex-Loc 32 Infant Car Seat. Featured with a 3-panel extendable canopy, deluxe softhead support and an flexible 5-point safety harness, your infant will travel safe and sound. The baby car seat base features 3 adjustable height amounts and is very easy to set up due to the push switch latch fittings. The maximum weight limit for the stroller is fifty pounds and 32 pounds for the infant car seat.